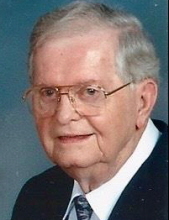 Joe Donald Carrington, 91, of Fulton, passed away at Fulton Presbyterian Manor on Saturday, March 23, 2019. He was born December 17, 1927 in Fulton, the son of the late George and Ada (Perry) Carrington. On June 10, 1951, he was united in marriage to Elsie (Koechig) Carrington. She preceded him in death February 10, 2018 after 66 years of marriage. Joe was a life-long resident of Fulton. He graduated from Fulton High School and proudly served his country in two wars. He was in the U.S. Army during WWII, and served as a member of the occupation force of Japan. During the Korean War he was stationed in Germany with Missouri National Guard Military Police. After his military service he worked twenty years for the Department of Revenue in Jefferson City. He then went on to become the OATS director for Callaway County, retiring in 1985. He and Elsie enjoyed their retirement taking bus tours throughout the country. Joe was a member of the Fulton Optimist Club, served on the Heart of Missouri Tourism Board, and was a lifetime member of the VFW. He was also a lifetime member of the First Christian Church of Fulton. Those remaining to cherish his memory include his son, Nathan Carrington (Pat); grandchildren, Beth Burnes (Taft) and Jimmy Carrington (Amberly); and great-grandsons, Lachlan and Arlo Burnes all of Kansas City, MO. Those preceding him in death include his parents; two brothers, George “Red” Carrington and Jerry Carrington; one sister Evelyn (Carrington) Haley. Funeral services will be held 11:00 a.m. on Wednesday, March 27, 2019 at Maupin Funeral Home in Fulton with Pastor Bruce Williamson officiating. The family will receive friends from 10:00 a.m. until the time of the service at the funeral home. Interment with Military Honors will be in the Callaway Memorial Gardens. Memorial donations are suggested to First Christian Church, c/o Maupin Funeral Home, 301 Douglas Boulevard, Fulton, MO 65251. To send flowers or a remembrance gift to the family of Joe Donald Carrington, please visit our Tribute Store. "Email Address" would like to share the life celebration of Joe Donald Carrington. Click on the "link" to go to share a favorite memory or leave a condolence message for the family.